Experience the pleasure of operating a classic breadboard crystal radio set: our Shortwave Crystal Radio Receiver. Listening to short wave signals with a crystal radio requires the highest Q circuitry, and we are convinced that our Shortwave Crystal Radio Receiver offers the highest selectivity and sensitivity in the 30m-50m short wave band. 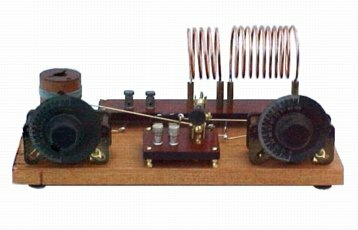 A product of years of careful refinement, and based on a classic circuit of the 1920s, this crystal radio is inductively coupled and has an impedance wave trap/antenna tuner. It features antique dials and top-quality original variable tuning capacitors and handsome original binding posts (brass or nickel-plated brass) mounted on a "breadboard" base of pattern-grade mahogany. Our Shortwave Crystal Radio Receiver offers operating and listening choices for both beginner and expert crystal radio users. For experts, it comes with a cat's whisker and galena crystal unit and a fine pair of antique headphones ideally suited to crystal radio listening. For beginners, it comes with an easier-to-use fixed crystal unit and an amplified speaker (mini amplifier). Crystal detection offers 100% distortion-free representation of the received signal and thus superior shortwave listening, and many of our customers have enjoyed adding this classic radio to their stereo systems. The radio's headphone output can be connected to an audio amplifier's 47k ohm phono input. This radio comes completely assembled and ready for use for countless hours of radio enjoyment. Must be used with an (easy-to-construct) antenna system. Complete set-up and operating instructions are included. Dimensions: 15 x 8 x 7 inches. Sorry, we do not offer a kit for this radio. To get answers to your questions or to place an order, please call us at 607-387-6752 or email us at pvsci@arcsandsparks.com.